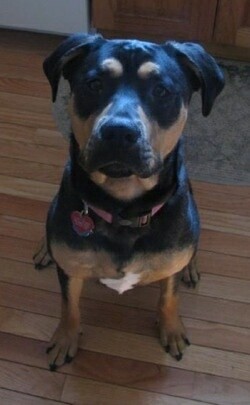 "Kira the 2-year-old female Rottweiler / Pit Bull mix loves to play with kids and is very good with them. She likes Milk Bones for treats. We got her when she was a puppy. She was the runt of the litter. Kira is very energetic, playful and very smart. Very good with other dogs, also likes the attention. Overall, she is a great dog." The Pitweiler is not a purebred dog. 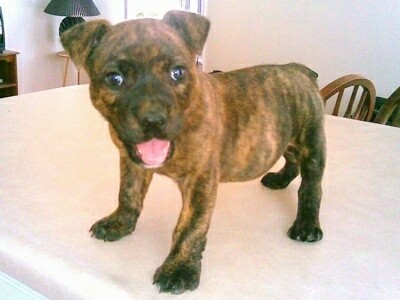 It is a cross between the Rottweiler and the Pit Bull Terrier. The best way to determine the temperament of a mixed breed is to look up all breeds in the cross and know you can get any combination of any of the characteristics found in either breed. Not all of these designer hybrid dogs being bred are 50% purebred to 50% purebred. It is very common for breeders to breed multi-generation crosses. Deva—her mom was an American Pitbull Terrier and dad was Rottweiler. "Sage is our 2.5-year-old, female Rottweiler / Pit Bull mix. We adopted her when her previous owner couldn't handle her and her destructive puppy ways. After many months of hard work (and tons and tons of exercise), we were rewarded with a faithful and intelligent dog. She is not a dog for a novice owner, but rather someone who has experience with strong-willed breeds. Training is kept up daily, and she is highly motivated to work. We are currently training her to compete in working dog sports and are having amazing success with her. Sage definitely respects an alpha personality and craves leadership. Without it, she can be a handful." 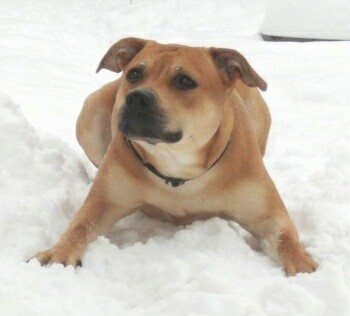 Sage the Pitweiler at 2.5 years old—"She is incredibly agile, and can hop 5-ft. fences without much effort. She needs an hour minimum of exercise per day, as well as plenty of mental stimulation; even then, she can be extremely destructive. She shares her house currently with a grumpy 10-year-old Jack Russell, and they get along well. We socialized her as much as possible as soon as we got her, and she has many doggy friends." 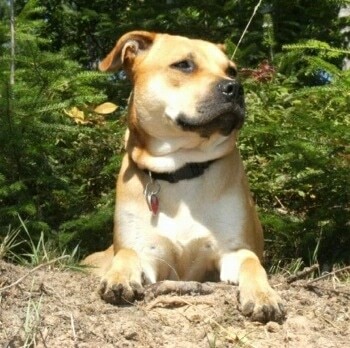 "Sage the Pitweiler at 2.5 years old—her father was a Rottie and her mother was a Pit Bull." 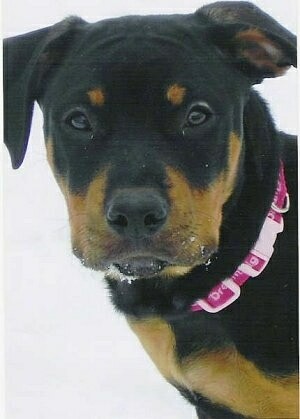 "This is Lacey, she is a Rottweiler and Pit bull mix. We rescued her from a shelter when she was only 5 months old. The rescue said she was found wondering the streets at 3 months old. They believe that she was bred for fighting, but did not meet the standards. She is now 9 months old, and has become my best friend. She is great with other dogs and people. She loves giving kisses and going on adventures. Lacey loves to play with her toy tire because that is the only toy she hasn't figured out how to destroy yet. The strongest dog I have ever had. I love it when I walk her down the street and people kneel down, she gives them kisses, they hug her then look at me and ask, "What kind of dog is this?" I laugh and say she is a Rottweiler and Pit Bull mix, and they just give me a blank stare like they expected her to be a ferocious beast. People say that they do not like Pit Bulls, and I say, "You will never know how loving they are if you keep thinking how horrible they are."" "This is our Chopper. He is Rottweiler and Pit Bull, but the sweetest thing ever. He is named Chopper after our motorcycle. So that makes him a biker, and as we know, Bikers only look Big and Bad; deep inside they are sweethearts..."
Chopper the Pitweiler—"...as seen in here where he is lounging with his kitties." Sheba the Pitweiler at 10 years old with Nia the purebred Pitbull Terrier—"Sheba is highly intelligent. She took to her training extremely fast and she is a very pleasant companion to have. 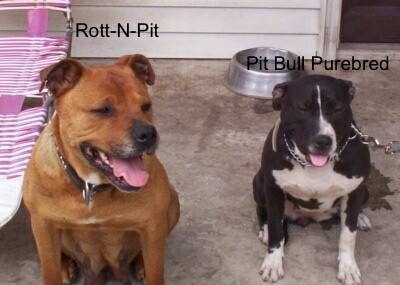 She is almost rust in color and poses well next to her Pitbull roommate Nia." "This is my dog Autumn shown here as a 5-month-old puppy. She is a Pit Bull / Rottweiler mix. There had been reports of attempted robbery in the neighborhood. Someone broke in to our house when my sister was the only one home. The man walked right into her room, saw my sister and ran upstairs. This is what drove my mom to get Autumn and now there have been no more reports. Just by this dog’s bark you can tell you don't want to mess with her. Since we got Autumn I have been more and more interested in American Pitt Bull Terriers rights. I think they are just as sweet as any other dog and are the best family dog. 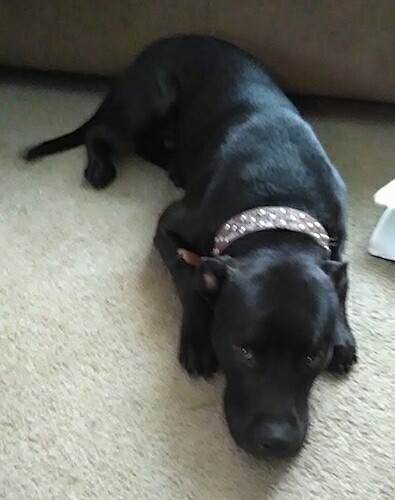 Autumn is a mixed breed Pit Bull, but she is the sweetest dog I have ever owned and I have had a White German Shepherd, 2 Yorkies and a Briard. Out of them she is the best, although she has a habit of licking and chewing on things in the trash, but we are working with her on that." "This is my puppy Kane at 2 months old. He is mixed with Rottweiler and Pitbull. 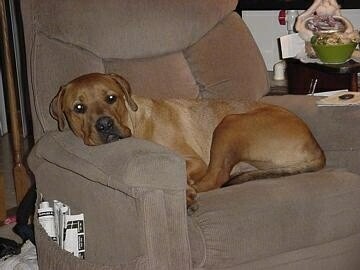 His mother was a full-blooded Pitbull and his dad was a full-blooded German Rottweiler. He is a very sweet and energetic dog. In this picture, he weighed about 10 lbs." 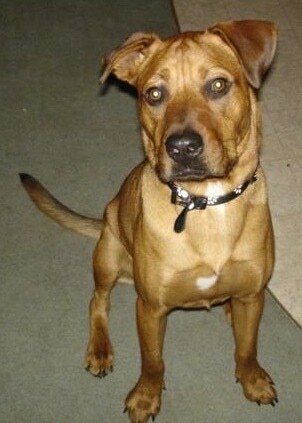 Kane the Rottie / Pit Bull mix breed—"Here is my handsome man again, weighing in at about 75 lbs. Don't let that face fool you, he is as sweet as those honey eyes of his. That's mama's big man!!" 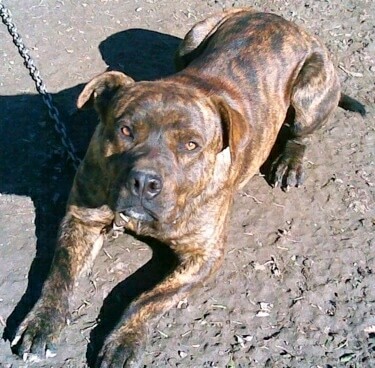 "Our Marble is a 2-year-old American Pit Bull Terrier / German Rottweiler mix. He is very loving and kind and is a very calm dog, but can be antsy and restless at times. He enjoys hunting small game such as rabbits and birds. He is a great guard dog, he is very loyal and obedient, loves kids, is very gentle with everything especially his toys and stuffed animals. He loves to run and play fetch as much as he can, and he has also taken a liking to Frisbee. He is a very beautiful dog that has intelligence to match. He is the best dog and companion a human could ask for." "I have a really neat dog named Dozer. He is a RottenPit. 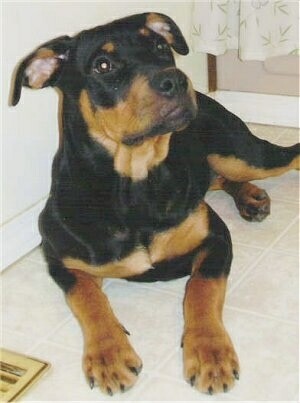 His mom was a full Rottweiler and dad was a full Pitbull. Dozer is real good with those he knows but aloof with strangers. Once he has warmed up to you he will be your best friend!! He is a very smart guy, he knows how to sit, walk very well on a leash and wait at doors and he waits for you to put his food down and doesn't touch it until you say get it. Dozer is only 14 weeks old!!!" "We call him a RottenPit ’cause he can be as ornery as they come, he loves to play with his two best friends Ladi, a Doberman and Jaxs, a Min Pin. He lives inside with us and his other canine friends and sleeps in the bed. Dozer is an AWESOME dog and we love him very much."